It is with great sadness and sincere regret that we inform you of the death of Bernie O'Sullivan EI6AX of Cahermore, Beara, County Cork. Bernie died on 9th November after a relatively short illness and his funeral took place on Friday last. Bernie was a great supporter of IRTS and understood and appreciated the work of the Society for radio amateurs and amateur radio. Up to the time of his illness Bernie was a regular caller on the Sunday HF Radio News bulletins. His signals were always superb and he was, so to speak, a beacon from the extreme western edge of the Beara peninsula. Up to a few years ago Bernie and his great friend John EI3BF were regular attendees at the IRTS annual dinners. In the years past Bernie regaled the attendance with his humorous poems and stories. His poem 'Pat and Pete' which was an account of an imaginary conversation between a mythical Irish radio ham Pat and St. Peter at the Pearly Gates is legendary. 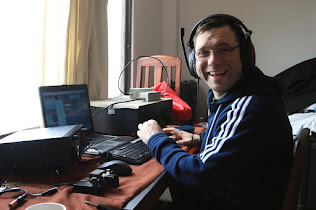 Bernie will be very sadly missed by his many friends in amateur radio both at home and further afield. To his wife Mary, his daughters Rose, Helen and Siobhán and to his sons Donncha and Pádraigh as well as to his extended family and friends we offer our sincerest sympathy.